Vista Studios-Gallery 80808, located at 808 Lady St. in Columbia, SC will be featuring native Columbia artist Noelle Brault from August 25th through August 29th. Wine and hors d’oeuvres will be served and all are welcome to come and enjoy some outstanding impressionist works of art featuring South Carolina’s own Capital City. Noelle was born and raised in the Columbia area and currently lives in the downtown Elmwood Park neighborhood with her husband Ed and their pets Cheyenne and Xerxes. 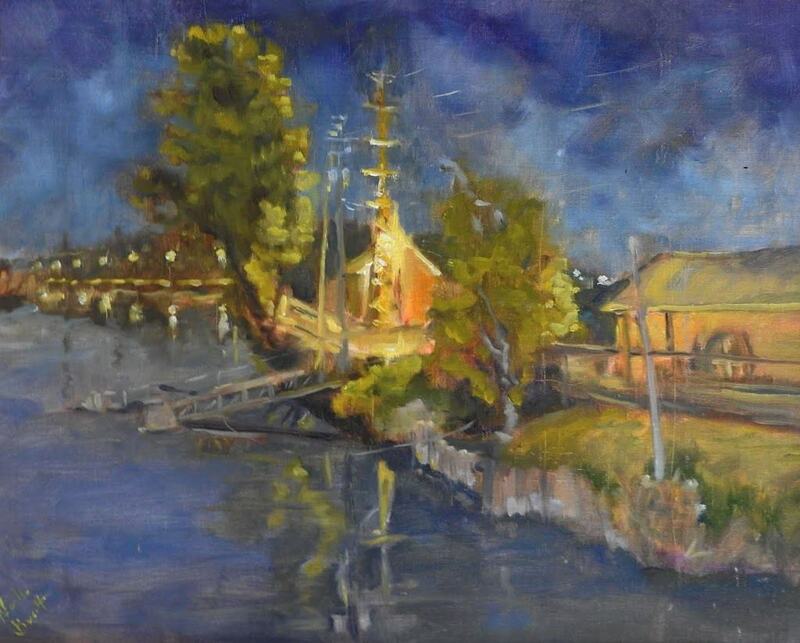 She loves to paint light and vibrant colors and prefers a medium of oil on linen panels. Noelle is drawn to impressionism because she is much more interested in the “flavor” of a scene than a depiction of it. Her paintings allow others to get the sense of being there to really appreciate the moment. 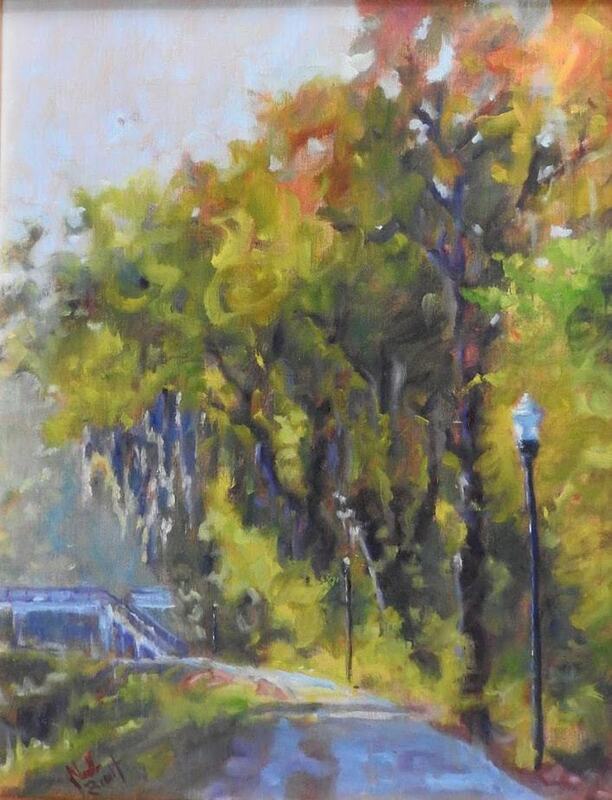 Noelle is best known for her landscapes and streetscapes of beautiful southern places. She enjoys the low country as well as the mountains. Since Ed was born and raised in Maine, she sometimes visits and paints beautiful coastal Maine scenes as well. Still, Noelle really loves to re-introduce Capital City residents to the Columbia that is so beautiful, right under our noses, but often overlooked. It’s nice to be reminded of all that Columbia has to offer and all the interesting things going on just outside residents’ own living rooms. Noelle has been painting since 2008, starting with classes offered by 80808’s own Michel McNinch. Noelle studied under Michel for several years and still goes back to class from time to time to get advice and paint with her mentor. The very first time Noelle showed one of her paintings in public she won the 2010 Central Carolina Food and Wine Festival poster contest. Since then she has won several SC State Fair awards, a prestigious plein air painting award given by her fellow artists, Best in Show at “Arts On The Ridge” in Ridgeway, SC, and Noelle even has a painting hanging in the SC Governor’s Mansion as a part of its permanent collection. Noelle is an associate member of Oil Painters of America and an associate member of the American Impressionist Society. She has paintings in several local business establishments (to include Sylvan’s Jewelers, The Capital City Club and Good Life Café) and has sold her “southern charm” paintings all over the country. To preview works by Noelle, please visit her website ( www.noellebrault.com ). Make sure to set aside Thursday evening, August 25th to drop by 80808, talk with the artist, enjoy some wine and food, and most importantly to soak in a fresh Columbia, SC through Noelle Brault’s beautiful original impressionistic paintings.